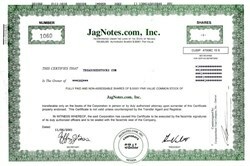 Beautiful certificate from JagNotes.com, Inc. issued in 2001. This historic document has an ornate border around it. This item has the printed signatures of the Company’s President, and Secretary, and is over 10 years old. JAGNotes is a leading worldwide Internet-based financial information service that provides its subscribers with diversified equity and fixed income content from a roster of highly respected financial commentators and other sources. JAGNotes also offers subscribers the company's flagship early-morning consolidated research product, which reports on stocks with newly issued research, analyst opinions, upgrades, downgrades and coverage changes.